OXFORD, Miss. – Josh Gladden has been named vice chancellor for the Office of Research and Sponsored Programs at the University of Mississippi following a nationwide search. The vice chancellor serves as the university’s chief research officer. Gladden, who joined the university in July 2005 as an assistant professor of physics and moved up through the ranks, had held the title of interim vice chancellor since 2016. The office serves and supports UM faculty, staff and students who are pursuing research or other sponsored projects funded by federal, state or private agencies and organizations. “I am absolutely thrilled and honored to have been chosen for this role,” Gladden said. “My time as interim vice chancellor reinforced how interesting and fulfilling this job is. While serving as interim vice chancellor, Gladden developed or played a leadership role in various initiatives such as Flagship Constellations, which includes multidisciplinary research teams of UM faculty and staff addressing grand challenges in the areas of big data, brain wellness, community wellbeing and disaster resilience. He also initiated or helped initiate programs at UM such as research development fellows and undergraduate research fellows, strengthened and expanded relationships in both the public and private sectors, and aided the university’s existing centers and institutes while fostering the creation of new ones, such as the Center for Graphene Research and Innovation. “We are so pleased that Dr. Josh Gladden will serve as the chief research officer for the University of Mississippi,” Chancellor Jeffrey Vitter said. “Dr. Gladden brings a wealth of experience and recognition as a national leader in his field. Increasing the impact of the university’s research and scholarly activities will require efforts on many fronts, Gladden said. Foremost among those endeavors are “firmly establishing the multidisciplinary Flagship Constellation teams, broadly telling the story of research at UM, growing undergraduate research opportunities, continuing to grow partnerships with both the public and private sectors, transitioning UM technologies into the marketplace and mentoring early career faculty in grantsmanship,” he said. Gladden was among four candidates for the position invited to campus for interviews and public presentations. “Dr. Gladden has a distinguished record as a researcher and university administrator who holds the respect of his colleagues,” said Donna Strum, the university’s associate provost, who chaired the search committee. Before joining the Office of Research and Sponsored Programs, Gladden served as director of the UM National Center for Physical Acoustics from 2013 to 2016. During that time, external funding for the center increased from $2.8 million to $6.2 million. Gladden was an assistant professor until 2011, when he was promoted to associate professor of physics. In July of this year, he was again promoted, this time to full professor of physics. 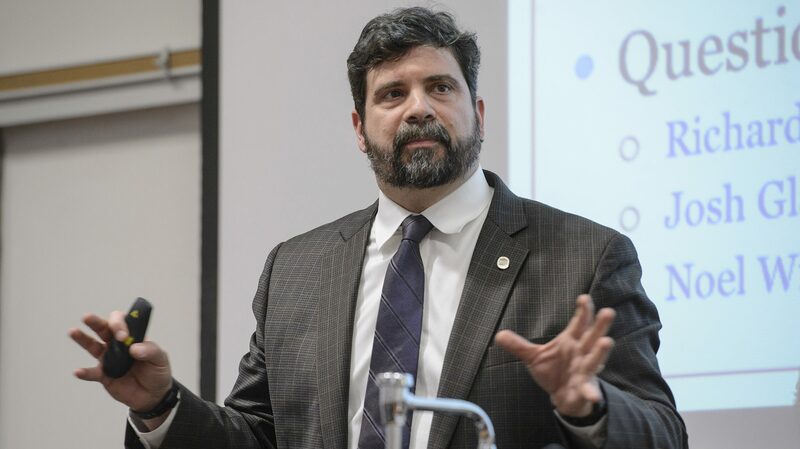 “I am elated that Josh Gladden has accepted our offer to be our next vice chancellor for research and sponsored programs,” Provost Noel Wilkin said. “He has a solid understanding of what it takes to facilitate growth in the research enterprise, appreciates the dynamics involved in faculty productivity and has a commitment to foster scholarship and creative achievement in all disciplines. Gladden earned his Ph.D. from Pennsylvania State University in 2003 and worked as a postdoctoral fellow in physics and mathematics at Penn State before joining UM. Before receiving his doctorate, he worked three years as a physics instructor at the Armand Hammer United World College of the American West in Montezuma, New Mexico. The college is an international school for gifted students representing approximately 75 countries with a network of 16 sister campuses on five continents. 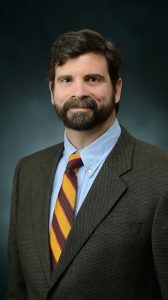 Gladden received his master’s degree in physics from the University of Montana in 1994 and his bachelor’s in physics from the University of the South in 1991. His research interests are focused on energy-related materials and include developing novel methods of acoustics and vibration sensing in harsh environments and using these methods to study numerous energy-related materials. Recently, his research has started focusing on vibrational and acoustic energy harvesting methods, as well as structural health monitoring in harsh or complex environments such as in storage casks for spent nuclear fuel rods. Gladden serves as president of the University of Mississippi Research Foundation and as chair of the Mississippi Research Consortium, which represents Mississippi’s four research universities – UM, Jackson State University, Mississippi State University and the University of Southern Mississippi – in developing and sustaining nationally competitive research programs. Gladden is a fellow and member of the Acoustical Society of America and a member of the American Physical Society and The Minerals, Metals and Materials Society. He has authored or co-authored 28 refereed publications and made 34 invited presentations. In 2007, Gladden co-authored a paper, “Motion of a Viscoelastic Micellar Fluid Around a Cylinder: Flow and Fracture,” which was listed in “Physics News of 2007” by the American Physical Society.